Marie De France ( late 12thC ) wrote Lais, or love poems of Breton/Arthurian Myths.. one such tale is the source of this painting. British writer John Fowles connects this ancient story within his novel 'Ebony Tower'. Hi Ted, thanks very kindly for your supportive comments.. the dynamics of underpainting bring a sort of lustre and energy to the topmost, finished painting.. so a glimmer of tone is sensed,rather than actually perceived. This style is fantastic. I shall try this on one of my future paintings. I am familiar with underpainting but have never seen it used so dramatically. The thing that inspired me to do this work was the necessity to create. I moved and had most of my belongings in my old house. In a fit of desperation I drove the 4oo mile round trip to get my cutting torch, hammer and some scrap metal. I painstakingly welded this thing together with no more than a Oxy/Acetylene cutting torch and some scrap wire from the concrete mesh. Ted, I think artists see almost everything in a different light. Jill, It was also very inconvenient to execute with such an impossible welding process. Fusing two reluctant pieces of rusty steel with no flux is not an easy task. But where there is a will there is a way! The minds of artists are hard to fathom. Art is in the eye of the beholder. BUT - artists see many things in a different light. 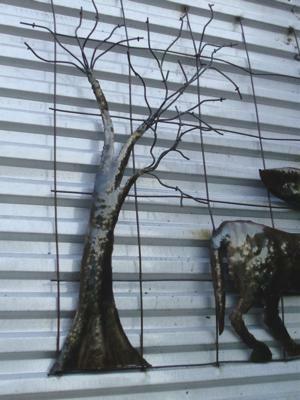 Some scrap metal and an inspiring idea and behold works of art transpire. That is so interesting, Dazzlin' Dave. Quite apart from the work itself, which looks quirky and fun, there is your recognition of that urge to create, however inconvenient it may have been to travel to get your gear. Well done on all counts and thanks for sharing. Later I mounted it on some roofing tin and framed around it with wood for reinforcement. 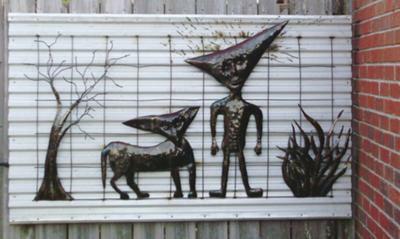 It was the only metalwork I did in '07. 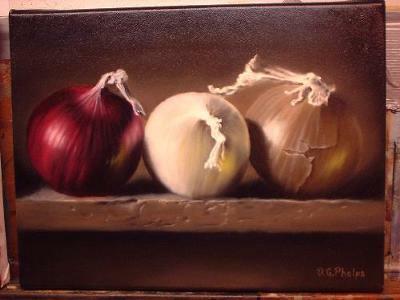 This was a commissioned work in which the client wanted onions with a dark background. Similar to a previous purchase of bell papers. This was done in the 7 layer Flemish technique that I use. Sorry I don't have any tropical examples yet, but I do have some orchids I'll be doing soon to post if you'd like. Looking at this painting with such realism. I have a watery mouth just staring at the painting. I can visualize them as being ready for my steak, my hamburger or hot dog. Even atop my schnitzel. All this and now I have to scrounge for something to eat. This has been such an inspiration. Delmus, I love your painting of onions. Who would think that such an "ordinary" subject could look so stunning. The colours (therefore tones) that you have used are so harmonious, yet exciting. 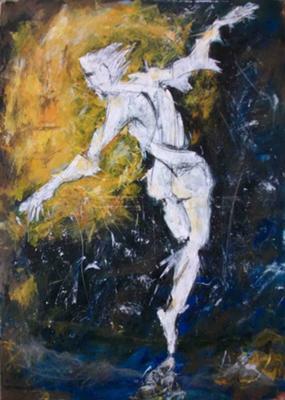 It is a little unusual these days to see artists using such classic oil painting techniques - well done and thank you for sharing. 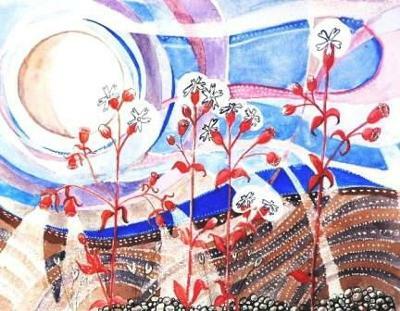 Festival season is looming and there will be a great many folk living in fields. 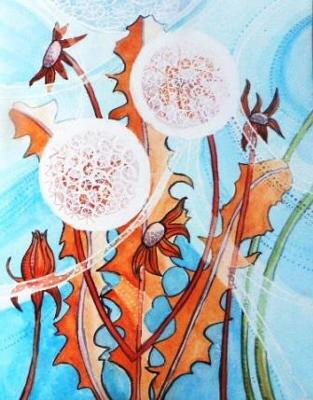 This painting is of two common field plants, dandelions and buttercups. Just lying back in the grass and feeling the sun, a half-open eye might spy something just like this! Wow, what a magical retro feel these have to them. Really reminds me of those long lazy summer days, spread out on the grass chilling to music. Years ago, in a log cabin three miles downriver from Dawson City, Yukon Territory, I raised five orphan Purple Martins.. releasing them into a sunny sky over the bank of Yukon River in Canada's north country. Each bird was perfect and gorgeous.. lovely bronze, lustrous dark purple feathers...ready for a long migration south. 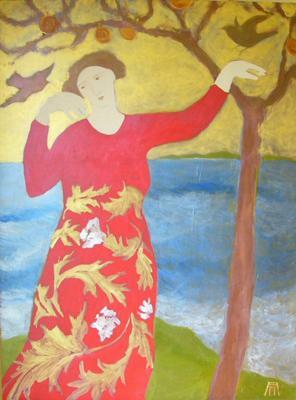 I think perhaps painting the woman's dress in red, was some compensation for saying goodbye. I love your painting style. Just staring at it I can appreciate the love you express in your work. Your story of the Purple Martins brought back a memory of mine. Many years ago, my wife found a baby Robin that had fallen from a nest, - no feathers and barely alive. She nursed it to health with milk from an eye drooper. As it revived she began feeding it bread soaked in milk and it thrived. "Baby" stayed with us all summer, would fly around our lot but always return and want to be with us inside our house. Most time after flying, it would alight either atop my head or on my shoulder. As fall approached, we realized it had to go south, but it would not leave. So I gently tossed it into the air. It was puzzled with this gesture and returned to my shoulder. I repeated this painful action, and it flew off. 3 days later it returned with a friend, both sat on the garage roof chirping loudly, as if to say 'we are friends'. Soon "Baby" flew back to my shoulder, pecked me on my ear then returned back to it's friend, as if to say thank you and I am OK. Both flew off, and I imagine headed south for the winter. Yes Anna, Ted E. has paintings on this site. Hello Ted, do you have paintings posted on this site? I would like to see your work. Again, thank you for commenting.. it means a lot to me..to have someone appreciate my paintings. Beautiful thought and such a lovely painting. 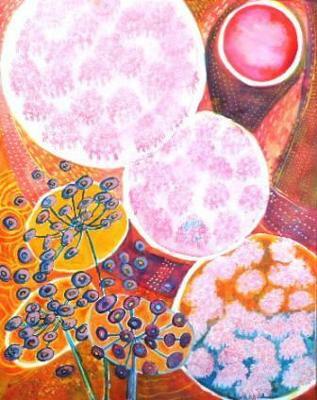 Two themes in my oil paintings, rainforest frogs and goddess mythology, came together in a series of dreams. 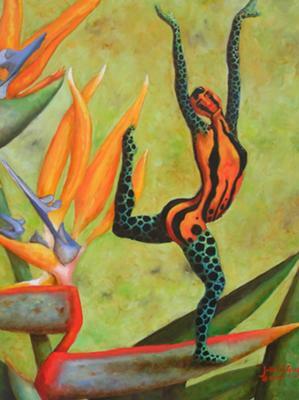 I'd awake from dancing images of Female figures vibrantly patterned as a rainforest frog. Petite Paradise is one of many images. This series also evolved into koi people. Julia, that's a lovely painting which gives us altogether a different way of seeing - which is what art is all about, isn't it? I shan't be able to see a frog in a heliconia flower ever again without turning it into a dancer (albeit one that hops and leaps!). 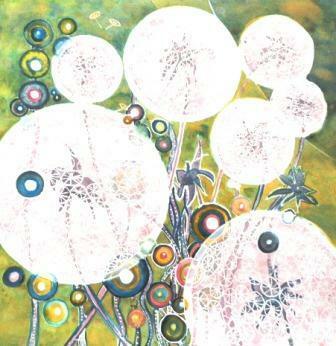 The pictures uploaded are my new artworks in 2011. In the previous year, I intended to paint the neat and refined fine art, especially with media canvas. 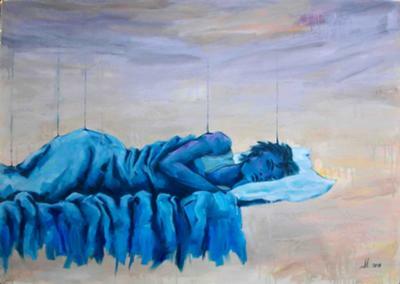 When I had an idea to be painted, I researched some relevant texts and visual references then processed it in my mind. Mostly, I processed the idea till the visual I wanted was imagined in my mind. It was long and tiring work. I feel unreleased on the canvas. And, the worst for me, I felt dishonest to the canvas and painting. So, in the beginning of this year, I decided to destroy all those constructions. Now, when I face the blank canvas or even my old paintings which haven't finished yet, I won't construct the visual. I just let the idea flow through my hand, my body, the colour, the brush, and/or many other tools to be visualized on the canvas or paper. Thank you very much for your comment, Jill. I do really happy to read it. For me, art is not only a workfield. It's about life, so it influence and lead my step. Thus, the art process is continuity and honest. Furthermore, the artwork is related to the personal life of the artist. We can just give any interpretation or judgment on the artwork without knowing the artist's life background, included his/her point of view, interest, social and cultural surrounding the artist. 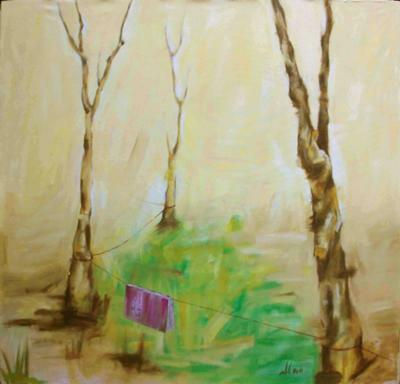 Beside painting on canvas, I also work on paper, selected trash, and other material for 3 dimensional artworks. Nowadays, with my other 4 artists, we make a group namely "Little Art". It's our reaction for the recent phenomenon of Indonesian fine art which give high and more appreciate on the artworks with big, giant, massive, expensive material. So, we make many artworks in the small size. 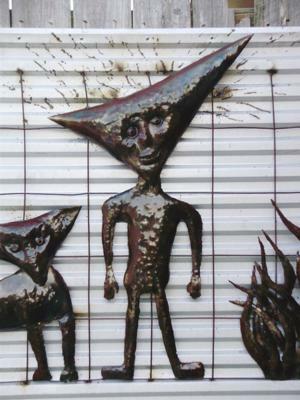 Those artworks are not only for 2 dimensional, but also 3 dimensional. If you or other artlover interesting, I could upload my artworks for this project. Unfortunately, those artworks is still in progress. That's great to hear, Allatief! I would agree with your new approach if you want to create original paintings that are truly art. And it's much more fun to respond to marks that you have made - an adventure, in fact. Enjoy the process! 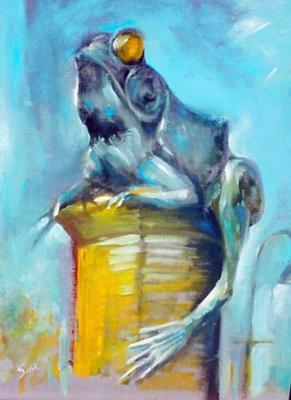 There is a bridge in Connecticut that has a sculpture of this Frog that inspired me to try to bring him to vibrant life by painting him in expressive tropical colors. After seeing this site, I feel sure that this frog would feel at home in Australia! I love your comments, Jill and Ted E! If you ever visit Windham, Connecticut, be sure to see our Frog Bridge! 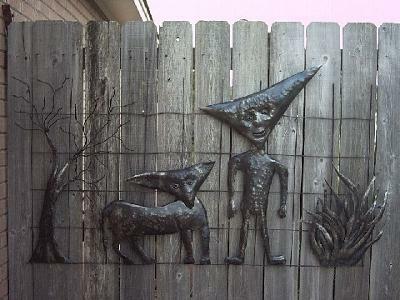 It was inspired by an old local legend. Sara, your frog painting is fabulous! The idea of a frog sculpture reminds me that in Australia (and perhaps in your country too) many small towns have huge sculptures erected as a promotion of their local industry. For example in cattle country one has an enormous bull, banana areas of course a monstrous banana, pineapples ditto, cassowaries also (endangered, not farmed!) and on it goes. Tully, which was two thirds wiped out by the recent cyclone Yasi, has an enormous gumboot at the entrance to their town. At least we know that those townspeople have a sense of humour. Thank you for being part of this site. You are right in thinking that your frog would feel at home here. Have you seen pictures of the white lipped green tree frog? They are abundant in the rainforest and like living with people too it seems as they can be found hiding behind pictures hanging on walls etc. Reminds me of a poem my older sister used to say to me. M A N Y M A N Y years ago. Which him aint got any nohow. Sorry, just could not resist reinventing my childhood. 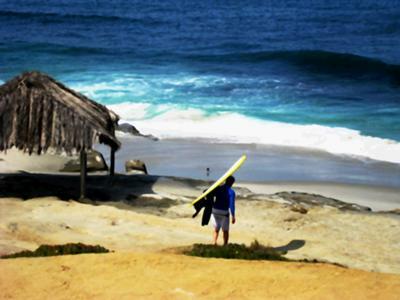 This is what a typical day at the beach in San Diego, California looks like. It is casual and always smells good. Wish I were there instead of HOT Chicago. Always humid and muggy, hence the Dog days of Summer. That is pretty as a picture. 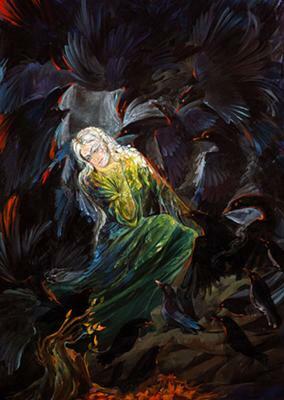 I would like to paint that scene. The mother nature is under human attack, so we have to keep it safe, far of any damage. 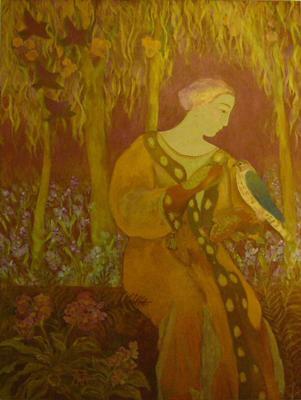 The use of such deep colors conveys the mystery of the piece. And I almost cringed when I first viewed it and studied its message. That's a powerful painting, Farhad. Thank you for submitting it. Artists have a real place to play in making others aware of problems and in seeking solutions to them, don't you think? Let's hope that we can all encourage your little new shoots to grow! Medieval women favoured female Merlins as hunting companions. There are four finches flying in the upper left of this painting as the untied hunter is being asked to wait by the woman. Love you relaying history and incorporating it into your painting. Having a hospital in Bath asking for work to deck their walls after a refurbishment, 'feel good' seemed the right name for the project. It is not an order, but hopefully it will do the trick for patients and visitors alike! Bella, what an interesting project and how nice to be asked to help out with your creativity and skills. I like the sense of repetition and patterning as well as the harmonious and happy colours that you have used in the paintings. You say that it wasn't an order but I hope that you were well paid as well as also having a 'feel good' experience yourself! I can imagine that patients would, indeed, begin to feel much better after looking at your paintings. What size are they? Are they in a general ward or maybe a speciality one? 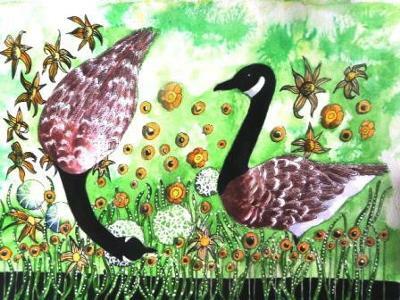 I am wondering if there might be an opening for artists to specialise in paintings, sculptures or murals for hospitals. What do others think? One of Chicago suburbs had added a new maternity wing to the hospital. They decided they wanted to have paintings to decorate the new area. 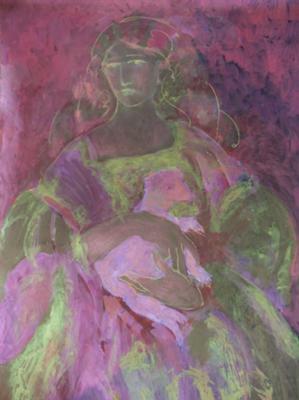 Several artists submitted paintings for their review, and all were made with maternity as the theme. After the panel looked at the paintings, their comment was to the effect, we did not think it would look like that. The artists were angry with the comment. 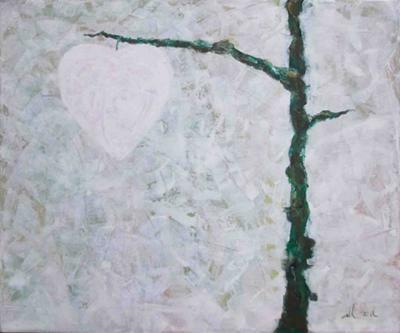 Ultimately ONE painting was selected to hang some place in the new building. I hope you will not experience this same treatment. 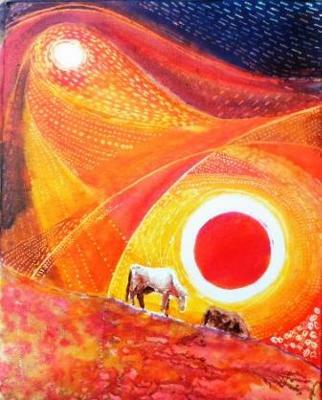 Hi Jill, I have not been paid as yet and I am to donate one of the paintings. They are all either 40 X40 or 30 X 40 cms in water colour or indian ink and I am about to start on an oil series too. Thanks for your kind and encouraging comment.